Coconut chutney as we all know is a very famous dip of south Indian cuisine. 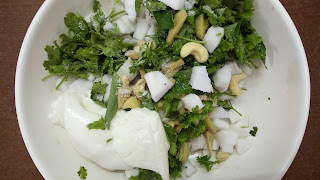 It’s mainly made with roasted chana dal or roasted peanuts, but here I gave a very different twist with a secret ingredient, cashews, it may sound little weird but trust me it tastes must better without peanut or chana dal. It not only make it thick but add creaminess in the chutney which kids like. Here in the pic you can see it’s not white in color, I gave twist in both color and taste which looks very attractive specially to kids. So what are you waiting for….make this twisty creamy coconut chutney today and share your feedback. Mix all the ingredients and blend to make fine paste, if required add 1-2 tbsp water. I didn’t use water. Store in fridge for 10-15 days. Serve with Rava dosa, Moong dal dosa, Multi-grain dosa, suji appam balls, idlis. 1. Blend all the ingredients well.